Yesterday’s announcement by NASA that astronaut Eric Boe has been removed from the inaugural piloted test-flight of Boeing’s CST-100 Starliner—tentatively scheduled to launch in August—came as a surprising blow for a veteran shuttle flyer who had been intimately involved in the Commercial Crew Program for several years. 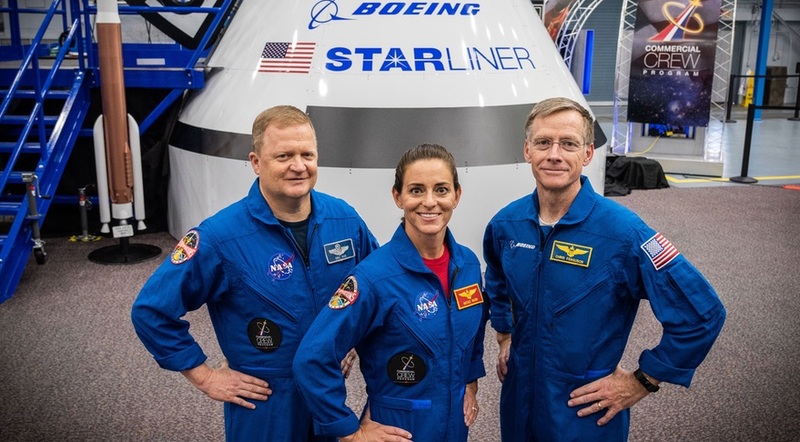 Boe was initially assigned to work with Boeing and SpaceX back in July 2015, alongside fellow astronauts Sunita Williams, Doug Hurley and Bob Behnken, and in August 2018 was named as part of a three-member crew for the CST-100 test-flight. His replacement is seasoned shuttle and ISS veteran Mike Fincke and the pair will exchange duties, as Boe assumes the mantle of assistant to the chief for Commercial Crew in the Astronaut Office at the Johnson Space Center (JSC) in Houston, Texas. The news of the CST-100 crew change came only hours before SpaceX prepared to perform a Static Fire Test of the nine Merlin 1D+ first-stage engines of its Upgraded Falcon 9. The 230-foot-tall (70-meter) booster was rolled-out to historic Pad 39A at the Kennedy Space Center (KSC) earlier this week. After the static fire test has been completed, another hurdle will have been cleared in readiness for a mid-February launch of the first unpiloted Crew Dragon. As is customary in such cases, NASA revealed only that Boe had been removed from the flight “due to medical reasons” and it remains to be seen if the retired Air Force colonel—who piloted shuttle Endeavour on STS-126 in November 2008 and also piloted shuttle Discovery’s swansong mission, STS-133 in early 2011—will remain eligible for future assignments. Boe, of course, is not the first astronaut to be removed from a formal mission assignment for medical reasons. Project Mercury astronaut Deke Slayton was pulled from his Earth-orbital flight in March 1962, due to heart-rhythm irregularities, whilst America’s first man in space, Al Shepard, was removed from command of the first piloted Gemini when he experienced the first symptoms of an inner-ear condition which left him grounded. Mike Collins might have flown around the Moon on Apollo 8 in December 1968, had he not been grounded for neck surgery earlier that year, an eventuality which eventually caused him to wind up on the prime crew of historic Apollo 11. And, most famous of all, in April 1970 Apollo 13 crewman Ken Mattingly was pulled from his crew two days before launch, following exposure to a suspected case of German measles. More recently, shuttle commander John Creighton came down with a heavy cold in February 1990, only days before launching on STS-36, a situation which later prompted NASA to assign a backup crew to the time-critical Ulysses mission later that year. A decade later, Christopher “Gus” Loria was dropped from the pilot’s slot on STS-113, following an accident at home and Carlos Noriega—named to STS-121—was pulled after only six months, due to a temporary medical condition. And within the last few years, shuttle astronaut Tim Kopra was removed from STS-133 after a biking accident and Karen Nyberg relinquished her position on STS-132 due to pregnancy. It remains unclear if last year’s withdrawal of Jeanette Epps from Expedition 56/57 was also a medically-related incident. Boe’s replacement aboard the CST-100 Starliner will be the United States’ fourth most experienced astronaut, Mike Fincke, whose 382-day cumulative spaceflight log already includes two six-month International Space Station (ISS) increments, a place aboard STS-134, the final voyage of shuttle Endeavour, and nine spacewalks. Fincke was named as head of the Commercial Crew Branch of the Astronaut Office in 2015, before taking up his most recent post as assistant to the chief for Commercial Crew in 2018. The new year promises to be an exciting one for Commercial Crew, as Boeing’s CST-100 Starliner and SpaceX’s Crew Dragon stand primed for an unpiloted test-flight apiece, a crewed test-flight apiece, and possibly an initial “operational” mission to the ISS before the close of 2019. The Upgraded Falcon 9 booster carrying the unpiloted Crew Dragon was raised to the vertical on Pad 39A earlier in January, with an expectation that after its imminent Static Fire Test a launch could occur as soon as 16 February. During the course of its two weeks in space, the Crew Dragon systems will be extensively tested, prior to the crewed test-flight as early as July with NASA astronauts Doug Hurley and Bob Behnken aboard. As for Boeing, its first unpiloted CST-100 Starliner—riding the first Dual-Engine Centaur (DEC), atop a United Launch Alliance (ULA) Atlas V booster from Space Launch Complex (SLC)-41 at Cape Canaveral Air Force Station, Fla.—is provisionally scheduled for March, after which the crewed test-flight by Fincke, fellow NASA astronaut Nicole Mann and former shuttle commander and current Boeing test pilot Chris Ferguson may occur in August. This leaves open a possibility that “operational” Crew Dragon and CST-100 missions might occur in August and December, transporting long-duration crewmembers uphill to the space station.